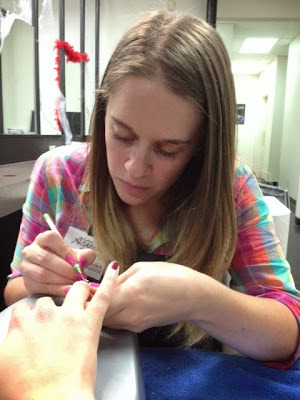 A candid shot of me doing Rachel's nail art (at the bottom of this post). I've really been enjoying learning acrylics. I never dipped into that aspect of nails prior to classes, so it feels like starting from scratch. It's admittedly frustrating to be so adept in one aspect of nails, and so clueless in another. There are so many factors to consider when working with acrylics, which is the generic term for nail enhancements that use monomer liquid and polymer powder. First, if your client wants to elongate their nails (as most do), should you do the service with a tip, or with a form? If you use a form, do they want the two-color method (forming a white tip with white powder) or the one-color method (where you can choose to only use pink powder)? Whether their nails be constantly painted is a big determinant for this decision. Second, which product works best for you and your client? Some products are odorless. If you've been around a salon that was performing an acrylic service, you've probably smelled the products. I don't think it's a bad smell necessarily, but it is pungent, so a sensitive client who understands the products may insist on an odorless combination. (It's not actually odorless, it's just less odor.) Unfortunately, whether you want to or not, you need to be skilled in using odorless, because Colorado's state board requires the use of odorless products. I'm still undecided about which I prefer. One thing that I did quickly realize is that odorless products dry more slowly. So to learn, they are a great medium, as you have more time to sculpt and work the product to look like you want. Acrylic application is actually a lot about the size brush you use. The brush sizes vary, usually in increments of 2. So 2, 4, 6, 8, 24! I've never seen a size 24 brush in person, but searching online has revealed that they do exist. Has anyone used that size? I'd love to get some nail tech chatter going about the preferred size, manufacturer, and shape of brush to apply acrylics! The polish did a nice job of covering up some of the flaws, but you can see edges that aren't completely clean, and I worry that they will lift. After a week though, they're still on, and the gal wearing them is a hair student, whose hands are constantly in water. This week, we started learning about the electric file. I feel like Rosie Riveter when I use power tools like that, and I can't wait to use it to smooth out enhancements and edges! Hopefully that will make my acrylics more beautiful than anything! Electric files have become much more strictly monitored in salons. In previous years, salons would run out to Home Depot and buy dremels to use on their clients. This led to all kinds of problems, so an agency called AEFM (Association of Electric File Manufacturers) stepped up and started providing education on the proper use of electric files. It's now a recognized seal, and if you want to be electric file certified, you want to attend classes with that seal of approval. At the end of our classes, we will be certified in that manner. Cute! We did this on regular polish (a bright orange-red from OPI called My Chihuahua Bites!). What's your favorite size brush for applying acrylics? Is there a brand you recommend buying? Which shape of brush do you like? I heard some nail techs dont use a file to do acrylics. do you know what they do instead? in my mind I guess it is a light buff but I have no idea. Some really experienced nail techs can go without filing the nail because their application is flawless. Generally a buff is always done to smooth out the surface before any polish or shine buff is done because once a shine buff is used any flaws will be visible!! Mel's right. You can also use a regular file, but it'll eat up a lot of your time. Generally, you want to apply the acrylics in such a way that minimal clean up and shaping will be required. With practice, I'm sure I'll get there, but not yet! Until then, I love my electric file! We played with them last night after this post went up. You can file, shape, smooth, and shine with the electric file. There are a wide variety of bits to attach that will give you different results. You can even use them on natural nails with the right bit! I dream about using an electric file after the state boards, because it takes forever to file down acrylics, otherwise. I like all of these, especially the Halloween ones.. Hair removal? Now that I haven't heard of for a nail tech or school to offer lol.. interesting though! I guess it's relatively new! So new that it's not on the board exam yet, but I imagine it will become popular and start appearing on more tests and exams. At least here in the states. Hi, Katy! Nail tech student (soon to graduate) and long-time reader here (Oh, and nail blogger, as well. Yeah, I'm keen on covering all the bases. LOL.). The more time I spend at the school, the more I realize they're training us to do well outside of school, not just pass the exams. In fact, we hardly talk about the exams at all until it comes time to do the Baby Boards (full practice of the whole exam). It makes me appreciate the price I'm paying a little more! Unfortunately, we won't be able to use the electric file on the exam, nor are we allowed to use it on real clients until we obtain the certification (which we won't do until we've got our license). At least I think that's the order. But just like driver's ed, we are allowed to practice with supervision, on non-paying clients. So we can do it on other students and our lovely volunteer models. Waxing does require a different license, if you want to wax anywhere above the elbow and knees. So basically, wherever you massage the client, you can also wax them there. I think it makes sense, though it's not something I particularly enjoy doing. It's messy! Thanks for your input Lisa, and congrats on almost being done with school! Keep in touch with the kind of continuing ed you follow through with, I'd love to know what programs are out there and how good they are! Hi! I follow your blog and these post like crazy! I started Cosmo school 7 weeks ago and I love it! Since I do part time (8:30-12:30) I do technically 4 days of acrylics. They are a pain at first but I kind of love the self form ones now. I've never used an electric file! It sounds scary to me lmao! We just use basic acrylic files in my class, but they seem to work great. I think it all depends on how you etch the nail. Now when applying the power, I'm wondering how you do it. My teacher showed us to never dunk the brush, but rather dip the tip in, and slowly circle it around until a med size bead forms. Then apply that to the nail while patting it down and not swiping. I've noticed doing that, while etching the nail before doing so, it doesn't get bumpy. It stays pretty even throughout even prior to buffing. Now when using tips, I'd def say etch the natural nail and after the tip is glued and applied, file that bump down. Then buff it and it should be fine. And yeah I've notice oderless liquid is harder to use. It makes the powder runnier which causes it to take time to dry longer. And I hate it lmao. Also, when doing water manis, do you use a brush when doing them? At my school, we simply take an orangewood stick and wrap cotton around when needed. Overall, how do you like it? Obviously, we're different since I do the hair and facial stuff, but I actually like doing the nails! 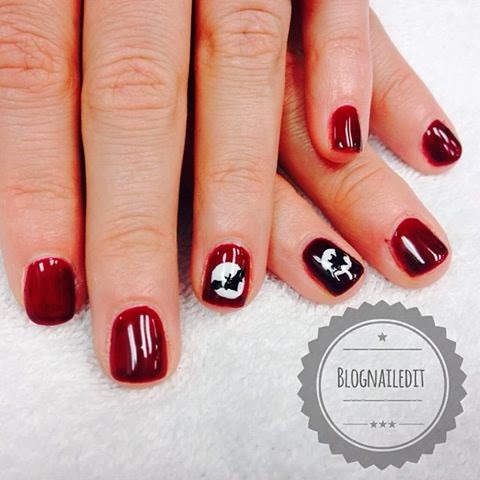 I have a question on your state board mani though. How is yours any different if at all? Hi kse93! I'm glad you're enjoying the posts! The electric file is a godsend. I'm so thrilled we're learning to use it. It cuts down the time we need to complete tasks by more than half. I'm still mastering getting a perfectly smooth nail just on application of acrylics. This past weekend, I did an incredibly long set of acrylics, so I needed a lot of beads to complete the look, and it took a lot of filing to get it smooth. The electric file really helped there. When we pick up beads, we also don't dunk. I lightly dip the tip of my monomer soaked brush in, and pull it toward me, so the polymer gathers around the brush in a nice bead. Obviously my brush isn't actually soaked in the monomer. Just enough to get the right consistency. Then I pat it out to cover the area, and once it's flattened out and it reaches the sidewalls, I'll lightly swipe it to blend with the previous bead. The first bead doesn't get swiped. It's usually the blending between two beads that causes slight bumps that I'll have to file later. In preparation for acrylics, we always buff the natural nail lightly, and the tip if we've applied one. We also use OPI's Bond-Aid, followed by Bond-Ex to help with adhesion. I'm not quite sure what you mean by "water mani". Can you elaborate a little on that? Overall, I love doing nails. I'm only in it for the nail tech license (I chose not to do full cos). I learn something new everytime I work on a client, so I'm thrilled we get real practice on real people before we enter the real world. We haven't discussed what the structure of boards will be like. We'll be practicing them soon, so I can let you know more at that point. I imagine it's quite similar to your procedure in California though. Do you work on a real model, or on a practice hand/finger?